National Day in Austria always falls on October 26th each year and celebrates the Declaration of Neutrality enacted on October 26th, 1955. 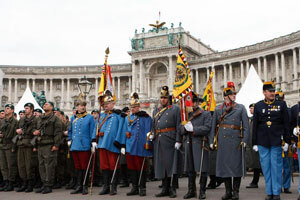 People will celebrate the day by the President and Minister of Defense will attend mass held on the Heldenplatz, and a wreath laying ceremony at the Crypt of the outer Burgtor, and later the government officials will attend a concert for Austria at the Vienna Staatsoper. People will often go to museums for free on this day as well as relax and spend time with family and friends. The Declaration of Neutrality was to get the foreign troops out of Austria by Austria declaring itself neutral in the cold war. Between 1945 and 1955 the Soviet Union, France, United Kingdom and the United States all had troops in Austria. This treaty allowed Austria to remain neutral and forced the other countries to remove their troops from Austria.